While thousands of Toronto residents were eager to see the return of art rockers Radiohead tonight (June 16), the sold-out concert, which was scheduled for Downsview Park, has been cancelled due to a stage collapse. According to CBC News, Toronto EMS reported that one person died and three were injured when the stage collapsed at about 4 p.m. EST during the setup for tonight's performance. The deceased is reportedly a man in his 30s and believed to be part of the stage crew. UPDATE: The man killed has been identified as Scott Johnson, who was Radiohead's drum technician, BBC reports. One of the injured was a 45-year-old man, who was transported to Sunnybrook Hospital with non life-threatening injuries, while the other two victims were said to have only sustained minor injuries. A Toronto police spokesman told Reuters that approximately 20 people were in the direct vicinity of the stage, doing rehearsals and sound checks, when it collapsed. According to reports, there were at least 1,000 people waiting to enter the venue by mid-afternoon. However, no concertgoers were yet inside the venue. 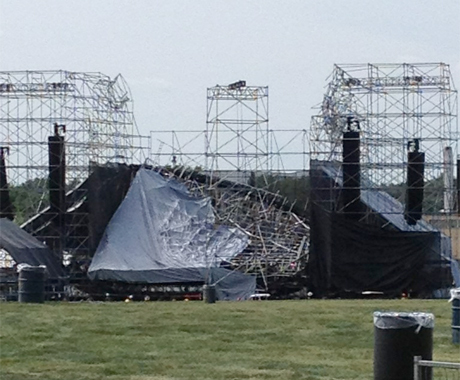 The official Downsview Park Twitter reported, "Radiohead concert cancelled. There has been an incident, more details forthcoming." Meanwhile, Radiohead themselves posted, "Due to unforeseen circumstances the Radiohead show at Downsview Park tonight has been cancelled. Fans are advised not to make their way to the venue. Refunds will be made at point of purchase. Further information is to follow." Twitter user Alexandra Mihan posted the above photo of the stage collapse. Weather was sunny and calm at the time of the collapse, with no reports of high winds. Police are now investigating the cause of the collapse. UPDATE 2: Radiohead drummer Phil Selway has issued the following statement regarding Johnson: "We have all been shattered by the loss of Scott Johnson, our friend and colleague. He was a lovely man, always positive, supportive and funny; a highly skilled and valued member of our great road crew. We will miss him very much. Our thoughts and love are with Scott's family and all those close to him."